Visit the Comox Valley Farmer’s Market for the best in fresh produce and so much more! The Comox Valley is home to great food from both the land and sea. In this issue, capsule we have touched upon some of the many options available at our doorstep. We are fortunate to have so many producers of local fruits and vegetables, viagra not to mention seafood and specialty meats within such a small geographical area. Check out the Comox Valley Farmers’s Market in Courtenay to pick up the freshest of the fresh this season. In addition to their regular Saturday morning Market, you can find them on Wednesday mornings during the summer, as well as evening markets on the third Thursday of each month. Or drive out to one of the many farms that sell direct to the consumer—Siefferts Farm in Comox is a bustling hotspot offering the best in fresh home-grown produce. In this issue we look at everything from a group of local organic farmers banding together to offer their wares, to a preview of the upcoming BC Shellfish and Seafood Festival taking place in June and highlighting the best of our local bounty from the sea, to a local craft distillery producing award-winning spirits. 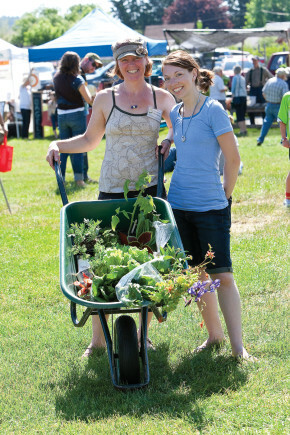 In this issue we celebrate the incredible bounty available at this time of year in the Comox Valley. The following recipes take advantage of just some of the ingredients available here, with a summer classic treat thrown in for good measure! Can be made 8 hours ahead. Cover and chill. What doesn’t go better on a hot summer day than ice cream sandwiches? This recipe is easy to make—the cookies are chewy and thick, making them perfect for sandwiching a layer of your favorite ice cream in the middle. When you take a bite, they buckle gently instead of breaking and are completely delicious once frozen—almost like a brownie! Heat oven to 350 degrees F. Line two baking sheets with parchment paper. Add butter and sugars to a large bowl and beat at medium speed until light and fluffy, 3-5 minutes. Add the egg, vanilla and salt and beat until well incorporated. In a separate bowl, combine the flour, cocoa powder and baking soda with a whisk. Slowly add the dry ingredients to the wet ingredients, scraping down the sides of the bowl as needed. The cookie batter will be very thick. Only mix until well combined. Drop cookie dough by rounded tablespoonful’s onto baking sheets. Bake 9-12 minutes or until the cookies have puffed a little and the tops are dry. Cool on baking sheets for 5 minutes, then transfer to a cooling rack and cool completely. Meanwhile, line a baking sheet with parchment paper. Scoop ice cream into 10 balls (about 3 tablespoons per scoop). Immediately place the baking sheet with the ice cream scoops into the freezer. Once the cookies are cool, remove ice cream from freezer and gently push the ice cream balls down to with the palm of your hand to fit the width of the cookies. Sandwich one pressed ice cream ball between two cookies. Enjoy immediately, or wrap with plastic or foil then freeze for later use. Makes 10 sandwiches. Enjoy the fresh taste of seafood with this quick and easy salmon recipe. A simple tip to keep the kebobs from spinning on the skewer is to use two skewers, rather than just one. Prepare barbeque to medium heat. Mix oregano, dill weed, salt, cumin and red pepper flakes in a small bowl and set aside. Beginning and ending with the salmon cubes, thread the salmon onto the skewers alternately with the slices of lemon (doubled in half), beginning and ending with the salmon. Brush with the oil and season with the spice mixture, patting onto the salmon. Turn the skewers over and repeat on other side. Grill, turning occasionally, until the salmon is opaque throughout, about 5-8 minutes. This simple pasta is perfect for summertime when tomatoes are at their juiciest and basil is abundant. Prepare the tomato mixture early in the day so it has time to meld the flavors together. Leave it at room temperature until ready to finish. For a vegetarian version of this dish, omit the prawns. Heat 1/2 cup olive oil in a saucepan on medium low heat and add 4 cloves of garlic. Sauté for about 1 minute to infuse the oil with the garlic. Do not brown the garlic. Add halved tomatoes, chopped basil, salt and pepper. Toss together and take off the heat. Cover and let tomato mixture sit at room temperature at least for a few hours. The longer it sits, the more flavor it has. Heat remaining 1 tablespoon olive oil in a frying pan over medium high heat; add remaining garlic. Cook for one minute. Add peeled prawns and cook until done, approximately three minutes. Season with salt and pepper to taste. Add the tomato mixture and half the cheese to the pasta and toss to combine. Season with salt and pepper to taste, if desired. Add cooked prawns, toss gently. Serve topped with remaining Asiago cheese.